Richway products are shipped from one of many locations in the United States and Canada and can be shipped to virtually anywhere in the world. This site is 100% secure with 128 bit encryption security on all orders. We accept most major credit cards or you can pay by check, money order or phone by calling 850-348-1541. The prices below are only for customers shipping to the areas listed above. All products on this page are 220V electricity. 220v electricity products are the same price as 110v products, but there is a 30-45 day estimated delivery time because this is custom order. If you need a 110V product, just email us after you've made your order and tell us so. Domestic shipping costs are different so if you are in the continenttal United States or Canada, please visit our domestic shipping and order page. with copy of your license. If you are a professional in the medical field, a certified Chiropractor or massage tharapist, you qualify for a $100 discount. When you order the Professional Package at full price, just email us a copy of your license and we will discount your cost $100. This comes without the pillow. This Biomat is made to fit massage tables perfectly so it's the Biomat for spas, massage therapists and chiropractors to use as a treatment or relaxation session. Along with the Professional, you receive a carrying case that has wheels and a handle as well as a 100% cotton cover for the Biomat. More information on Professional Biomat. IF YOU ARE A HEALING PROFESSIONAL (DOCTOR, MASSAGE THERAPIST, CHIROPRACTOR, ETC. ), GET $100 DISCOUNT ON THIS PACKAGE. This Biomat is perfect for massage tables so it's great for spas, massage therapists and chiropractors to use as a treatment or relaxation session. Along with the Professional, you receive a carrying case that has wheels and a solid handle as well as a 100% cotton cover for the Biomat. includes the Richway Amethyst and Tourmaline Pillow which has a therapeutic shape to provide additional support for your neck while comfortably supporting your head. More information on Pro Package. This is an elastic polyurethane memory foam pillow that has a therapeutic shape to provide important neck support to ensure an ergonomic sleeping posture. Channels of Amethyst and Tourmaline crystals carry BioMat energy deep into the cerebral spinal column and brainstem while at the same time keeping the head cool, allowing the body to receive higher temperatures when used with the Biomat. The 100% cotton zip cover can be removed and used as a body wrap for chest, stomach, arms, and legs to assist in relief of many ailments. More info on Pillow. This is the perfect travel Biomat and is great to use in reclining chairs, Med-Spa, dental & office chairs. It works great for kids. The Amythest Biomat Mini comes with a single control panel, travel bag and 100% cotton quilted cover. More information on Mini Biomat. The Single Biomat perfectly covers a single sized bed and is great for a good night's rest. Lay it on the couch and watch television as it works it's healing and relaxation magic. More info on Single Biomat. The Amethyst Biomat Queen Size is great for a queen-sized bed. Lay it on the living room floor for your kids to watch television on. It comes with dual control to adjust settings on each side seperately. This means each side of this Biomat can be adjusted to different levels of performance. More information on Queen Biomat. Richway's King Sized Biomat is the big daddy of Biomats. Like the Queen, each half of the King Biomat can be controlled separately so that two people can use it at once at different settings. So, if you have a king size bed, this is the Biomat for you. More Information on King Biomat. 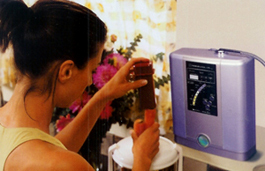 The Alkal-Life 7000SL is a water purification and ionizer system. For ease of use it is also voice automated. It creates purified alkaline ion water from ordinary tap water. Replacement filters are available. It provides energy, hydrates and absorbs nutrients quickly, brings your body pH into balance, extends life of cut flowers and promotes plant growth. Alkaline ionized water contains many Hydroxyl ions. Hydroxyl ions remove free radicals which are unstable oxygen molecules that cause damage and disease to our bodies. Once the Hydroxyl antioxidant and free radicals have cancelled each other, the result is that body is supplied with extra oxygen and energy. More information on Alkal Life.. The Rejuvena sL generates a wide range of ultrasonic vibrations and allows nutrition to penetrate deep into the skin through the Netzschicht layer. 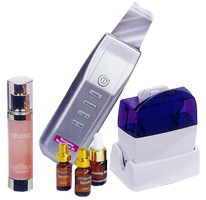 The result is healthy, supple skin and better blood circulation removing wrinkles. When the skin cells are influenced by the micro-vibrations, the waste material, free radicals, toxins are eliminated from the cells naturally. When the vibrations stop, fresh nutrition is absorbed into the cells to fill the space made by the elimination of waste materials. Leaves skin feeling refreshed and looking more youthful and clear. More information on Rejuvena.